RUMURUTI, Nairobi, Mar 16 2016 (IPS) - For two decades, Dickson Kamau only grew maize on his 0.5 hectare (ha) of land earning himself the nickname Kamau wa mbembe or Kamau who owns maize in his native Kikuyu language. “The maize business was always very good. Good production and the profit was enough to provide for my family and educate all my seven children all the way to the university,” he told IPS. As a result, this commercial maize farmer rose to become one of the main suppliers of maize in his small village of Rumuruti in Laikipia County located on the Equator in the Rift Valley region, some 266 kilometers from the capital Nairobi. But climate change, particularly rising temperatures, high cost of fertiliser and pesticide as well as poor storage facilities almost brought his maize business to a halt six years ago. “Farming is largely rain-fed and with rising temperatures and unreliable rainfall, this has compounded the problem for farmers who lack water storage facilities,” Prof Mary Abukutsa-Onyango, a professor of horticulture at Jomo Kenyatta University of Science and Technology (JKUAT) told IPS. The country also suffers from poor irrigation infrastructure with government statistics showing that only 105,800 ha are under irrigation against an estimated potential of 539,000 ha. Kamau’s experience mirrors that of farmers across this East African nation and though he knew he needed to change course, just like many farmers stuck on old and familiar methods of farming, the challenges facing him seemed insurmountable. “When I first started farming agricultural extension officers visited us regularly, but as the number of farmers increased, their visits reduced leaving us without information on new farming practices,” he says. 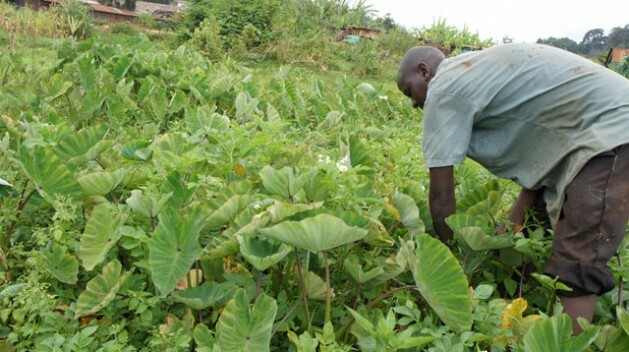 Although the Food and Agriculture Organisation of the United Nations (FAO) standards demand that there should be one extension officer to serve 400 farmers, currently, one extension officer serves 2,000 farmers. It is against this backdrop that, in order to overcome a myriad of challenges facing the agricultural sector, FAO has been at the forefront in the implementation of climate-smart agricultural initiatives. According to Robert Allport, assistant representative programme implementation at FAO Kenya, these initiatives aim at building resilience as well as sustainable food and nutrition security. Prof Abukutsa-Onyango says that such initiatives are vital since the agricultural sector is constrained by a variety of challenges. “Low agricultural productivity caused by low input use, unsustainable soil and water practices and the diminishing size of average land holdings as farmers sub-divide and sell part of their lands,” she says. FAO statistics show that agriculture is vital to the country’s economy, contributing an estimated 26 per cent of gross domestic product (GDP) and another 27 per cent of GDP indirectly through linkages with other sectors. The sector employs more than 40 per cent of the total population and more than 70 per cent of Kenya’s rural people. Against this backdrop, FAO has continued to address the challenges facing farmers in several counties including Laikipa, Nakuru and Siaya. The organisation worked directly with over 3,000 households. “The message was clear that if farmers continued to hang on to traditional methods of farming, the changing weather patterns were going to kill our farms,” Kamau who is a FAO beneficiary expounds. Allport says that climate-smart agriculture entails identifying and applying the most appropriate activities for responding to specific climatic challenges in a given location. As a result of FAO’s intervention, Kamau says that most maize farmers who used to harvest once per year which means they make about US $13 to $15 dollars per bag of 90 kilograms of maize per season now harvest twice per year. “When you harvest only once per year and crops fail due to bad weather, the farmer can take a long time to recover from the loss because they put all their resources into that one season,” he explains. Farmers were also taught how to diversify and plant various crops. “Many of us begun planting potatoes in addition to the maize farming, we use a bag of about 80 kilograms to package our potatoes and it goes for about US$ 20 to 25,” added Kamau. Patrick Muraguri, an agricultural extension officer in the area explains that farm produce is cheapest immediately after harvest. “One or two months after a harvest the same bag of maize can cost US$ 22 to 35 dollars and the same bag of potatoes can shoot to US$60 dollars,” he says. Kamau agrees saying that a lack of good storage facilities means that farmers have to sell their produce within the shortest time possible. “We therefore flood the market with similar products and due to an oversupply, prices go down to a point where most of us do not make any profit,” he says. FAO says that successful implementation of the recommended practices has enabled farmers to double their productivity levels and to also double their profits. “But there are many other households that have not been reached with interventions and there is need to address the challenges that they face in order to strengthen the agricultural sector,” Muraguri says.